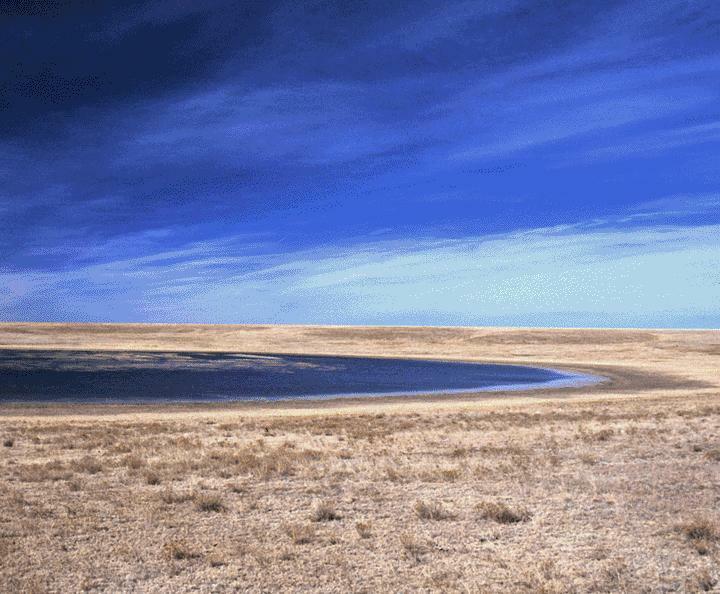 There are few elements more important for sustaining life on the High Plains than playa lakes. Yet, these circular lakes are all-too-often misunderstood or ignored. Don Kahl, Natural Resources Specialist with the Texas Parks and Wildlife Department, recently spoke with High Plains Public Radio about the importance of these unique resources, and about the Texas Playa Conservation Initiative. 1. What exactly is a playa lake? Is the term "lake" a misnomer? Playas are clay lined basins and are the low point within a self-contained watershed. They are ephemeral in nature, meaning they are not permanently flooded, and their flooding depends upon runoff from surrounding uplands during heavy rain events. Some playas can go years without holding surface water, so the use of the term “lake” is a bit misleading, especially to those who are not from the region or who do not understand the wet-dry cycle of the playa system. 2. Tell us, briefly, about the Texas Playa Conservation Initiative. The Texas Playa Conservation Initiative, or TxPCI, is a partnership of government agencies and non-government organizations, with a focus on restoring and conserving playas in the Texas High Plains. We specifically work to restore playas on private lands, for the benefit of wildlife and recharge of the Ogallala Aquifer. We concentrate on the backfilling of tailwater pits on grassland playas, but we also conduct grassland buffer restorations as well. Our program pays for 100% of the cost of restoration and we also offer an incentive payment to the landowner. 3. Why are playas important? Playas are the primary gateways for aquifer recharge in the southern expanses of the High Plains. In Texas, recharge rates of the Ogallala through playas is 10 t0 100 times greater than the rate of recharge through the uplands that surround them. The fact that a playa alternates between wet and dry periods is important for their overall health and for their function. For maximum recharge to occur, a playa should be dry for a period of time that allows the clay soils that line the basin to dry and shrink. Large cracks form in the claypan, and during a heavy rain event, the runoff that flows into the basin reaches these cracks and begins its journey through the playa to the aquifer below. It is important to have a well-managed grassland buffer surrounding the playa to help filter silt and contaminants from the runoff as it makes its way to the playa and underlying aquifer. Once the clay soils begin to hydrate and expand, the clay layer seals and water begins to pool above the ground. The now wet playa quickly explodes with plant and animal life. Wet playas are a popular and important destination for migrating waterfowl and shorebirds, while also important to an array of resident wildlife. 4. This Texas Playa Conservation Initiative concerns much of the area within the High Plains Public Radio listening region. What can our listeners do to improve our playas and prairies? There is an abundance of conservation organizations and programs throughout the Playa Region are available to help landowners in restoring and conserving playas. To learn more about what is available in your area, we suggest you contact your local state wildlife biologist or NRCS office. For those who would like more information about our program or about playas in general, you can visit PlayasWorkForTexans.com or PLJV.org. 5. What's the Texas Playa Conservation Initiative's end, dream goal? There are an estimated 80,000 playas throughout the Great Plains, with a little more than 23,000 playas found in Texas alone. Sadly, there are many playas that have been so degraded and altered, that they are beyond repair. Our hope is to restore as many playas as possible, but our main goal is to change the way people view and treat their playas. They are a truly important resource, and it is our generation’s responsibility to ensure they are there for the next generation. Restore and conserve your playa and put your playa to work for you and for wildlife. 6. Are playas ever perfectly circular? Or is that a myth? Playas can vary greatly in size and shape. I can’t say with any certainty that there are or aren’t any perfectly circular playas, but my sense would be it is highly unlikely that there is a perfectly circular playa. There are probably many that come close, though. Today a playa-rehab success story. Eastern New Mexico rancher John Wood owns a 2,800-acre cow-calf operation about 40 miles north of Clovis. The land has a a 250-acre playa that was rehabbed with the help of The Nature Conservancy. Many playas on federal grasslands in southeast Colorado, southwest Kansas, New Mexico and the Oklahoma and Texas panhandles have pitted playas. There's a cooperative effort underway to rehab some of these playas. What's The Problem With Pits? A functioning playa provides water to recharge the aquifer. There's also a whole community of wetland plants and invertebrates that need the very shallow water found in a healthy playa. These plants and invertebrates provide food for migrating birds. We grew up on the High Plains thinking of those occasionally muddy pasture depressions as "buffalo wallows," "rainwater basins" or "mud holes." Turns out, scientists are learning those playas play a significant role recharging aquifers such as the Ogallala. Shaw Family Farms produces 1,000 calves a year. The cows and those calves require lots of forage. A field under crop production has several playa lakes, and that often made farming the field a challenging proposition. VANCE: Hey! I'm Vance Ehmke and we farm in Lane County KS. Today Louise and I are going to talk about playa lakes. LOUISE: Here in this part of the state we are truly the Saudi Arabia of playa lakes because there are over 23,000 in western Kansas-the most in the world. VANCE: We have mixed emotions about the playas. I don't know how many times we've had to pull tractors or combines out of them. And I can't count the number of crop failures we've had because of them. LOUISE: But on most days we're thankful for them. If all we had were flat Harney silt loam soils, we'd lead a pretty plain life. But with the playas,we enjoy a lot of scenic and aesthetic breaks along with a greatly diversified flora and fauna. Research indicates that a buffer surrounding a playa lake, consisting typically of native grasses and forbs, prevents migration of upland topsoil and farm chemicals into lowland wetlands such as playa lakes and rainwater basins. Playa lakes are effective vectors for groundwater recharge and water filtration, but that assumes they're in a healthy state. Water, soil and habitat specialists discuss the causes of sedimentation and talk about playa restoration.